From 13 November 2009 to 13 February 2010, Galerie m Bochum is presenting an exhibition of never-before-published landscape photographs by Simone Nieweg (*1962 Bielefeld). Nieweg lives and works in Düsseldorf, where she studied at the Art Academy and was a master student of Bernd Becher. Gardens as well as field, forest and meadow landscapes are the subjects she has been focusing on since 1986 or 1990, resulting in a kind of long-term study. 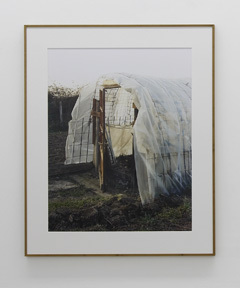 The present exhibition centers on large-format color photographs showing garden structures such as sheds, greenhouses and trellises. Also on view are recent landscapes shot in northeastern France that herald a new pictorial vocabulary within the artist’s oeuvre. On prolonged forays through gardens and fields, Simone Nieweg develops intimate knowledge of her motifs. She returns again and again to certain spots in order to find just the right conditions for her shot. On the matte lens of her large-format camera, the image appears upside down – an important abstracting moment in which Nieweg is able to balance out perspectival distortions, choose the desired degree of detail and lend the overall picture order and structure. Her concentrated gaze uncovers the aesthetic situation within the organic fabric before her, something Nieweg calls the “perfect coincidence.” She then converts the reality she sees into a composition in which structures, lines and colors shape the image. And yet a tension nevertheless remains between the structured composition of the photo and the relative anarchy of the gardens and landscapes depicted. The large-format works show largely improvised miniature architectures whose materials are just as diverse as the plant life itself. 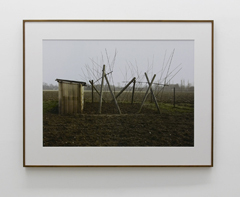 What continually comes to the fore in Nieweg’s photographs are the parallels between manmade objects and nature, such as in “Glasshouse with steel lattice” (2004), where the ramification of the branches in the background is echoed by the arched roof of the glasshouse. At the same time, we feel a sense of harmonious dichotomy: in terms of content, between the rusting provisional structures and the living greenery, and compositionally with the weighing of horizontals and diagonals, of frontal and tilted viewpoints, of surface and detail. 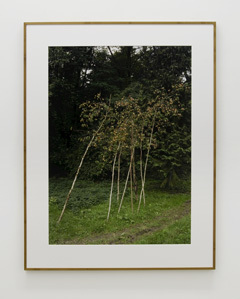 Nieweg avoids any clichéd associations, picturesque motifs or narrative elements in her landscape pictures. Her works focus our gaze instead on the two-dimensional image, without however estranging us from nature. The pictorial planes are hallmarked by a visual fecundity that comes from the earth, the vegetation, the geographic situation, the climate and from the human hand that has shaped the scene. Materiality, color and surface structure evoke a very specific texture. Ultimately, what the photographs of Simone Nieweg convey is an overwhelming impression of timeless serenity and harmony. More information about Simone Nieweg.